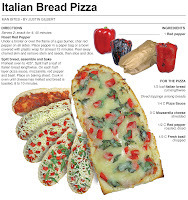 When most people think of pizza they imagine flat round bread with sauce and an assortment of toppings. One of my favorite non-traditional ways to make pizza is to split Italian or French bread and use it as a substitute for the dough. I like these types of crusty breads for pizza because they have the crunchy outside, created by steam while the bread bakes, and a fluffy, delicate interior. The addition of cheese and toppings helps create a delicious bite as good as any traditional pizza. 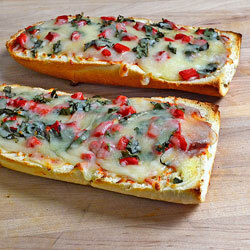 For this recipe, I use Italian bread and top it sauce and mozzarella cheese. To make it stand out, I add fresh basil and roasted red pepper. A red pepper is a green pepper that is left on the vine to ripen, in the process it changes color and becomes sweeter in flavor. Roasting it brings out more of the sweetness. 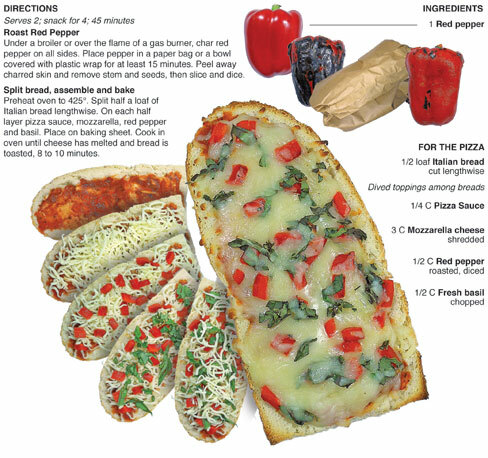 The combination of the roasted pepper with the aromatic fresh basil gives the pizza a garden fresh flavor that works not on just pizza, but sandwiches and wraps as well. This recipe was made from leftovers from my last recipe. (Italian Roast Beef Sandwiches) There was a lot, so I threw this together for lunch on a whim. I decided to document it for future purposes and after devouring a couple slices, I thought it was tasty enough for the print column. 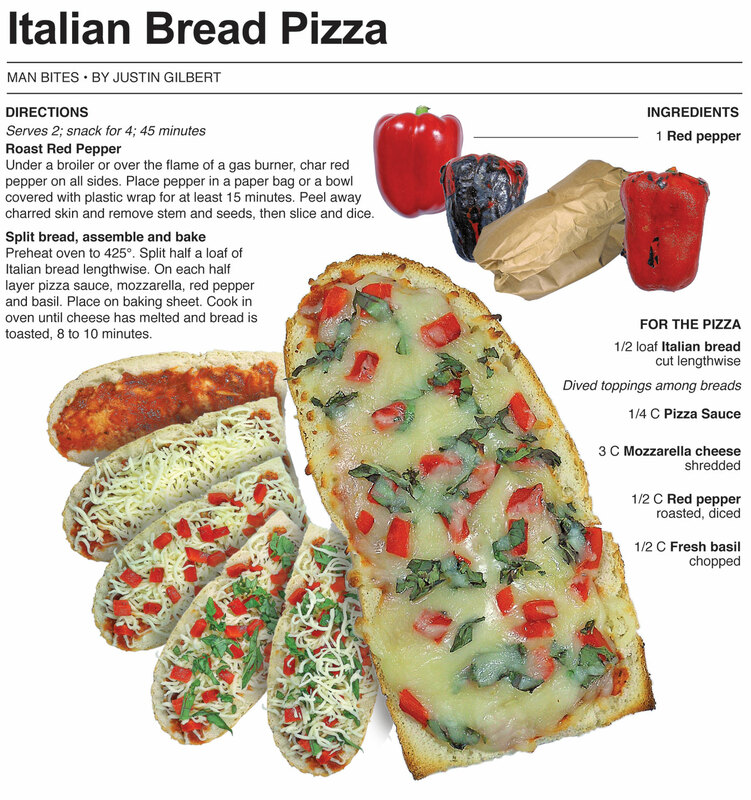 I have always used french bread when making this type of pizza but I had half a loaf of Italian bread left over and decided to use it. I really couldn't tell any difference. This is the third "Italian" themed recipe in a row here at Behind the Bites - I think it's time to move to another region of the world for a couple of recipes.